Primary sclerosing cholangitis (PSC) is a condition where the bile ducts are diseased and become thick, hard and narrow. This prevents the flow of bile through the ducts. Although there are many diseases that can damage the bile duct (secondary cholangitis), in primary sclerosing cholangitis there is no underlying disease that can be identified which affects the bile ducts. It appears to occur independently. Over time the narrowing can reach a point where the bile duct is almost entirely occluded with a complete stoppage of bile flow. It may lead to severe and even permanent damage of the liver which can then progress to liver failure. Who gets primary sclerosing cholangitis? Men are at a greater risk of developing primary sclerosing cholangitis and about 3 out of 4 PSC patients have inflammatory bowel disease. The link between these two conditions is not fully understood but less than 5% of IBD patients have PSC. The disease is often diagnosed after the age of 40 years but may have started in early adulthood or even childhood. The bile ducts are a network of passages that drains bile from the liver and allows it to be distributed to the gallbladder or expelled into the small intestine. Some of these ducts are located within the liver (intrahepatic) and others lie outside of the liver (extrahepatic). When the walls of the duct becomes inflamed, it is known as cholangitis. There are many different causes of cholangitis such as bile ducts stones, bacterial infections and sometimes viral infections as is seen in AIDS patients. Inflammation of the bile duct wall if severe and prolonged can lead to scarring. This is known as fibrosis. In primary sclerosing cholangitis there are no underlying diseases of the bile duct that can be identified as a cause of inflammation. It is believed that the inflammation is due to an autoimmune mechanism. This means that the body’s immune system attacks the duct wall thereby causing inflammation. The autoimmune link is further supported by the fact that most patients with primary sclerosing cholangitis also have inflammatory bowel disease (IBD) and especially ulcerative colitis. The build up of scar tissue in the bile duct wall causes it to thicken and narrow. This impedes the flow of bile (cholestasis). Bile is necessary for the emulsification of fats in the gut. When the ducts are obstructed, there is disturbance of fat digestion leading to a host of bowel symptoms. As the condition worsens, there may be almost complete blockage of bile flow. This can cause a back up of bile in the liver and the symptoms of obstructive jaundice becomes apparent. Eventually cholestasis may progress to liver damage (cirrhosis). Initially primary sclerosing cholangitis may be asymptomatic if the flow of bile is not significantly impeded. This asymptomatic phase can be as long as 10 years in some cases. Gradually symptoms become apparent. However, at the outset the symptoms may be vague and not attributed to the biliary tree until the liver is significantly affected thereby leading to symptoms such as jaundice. 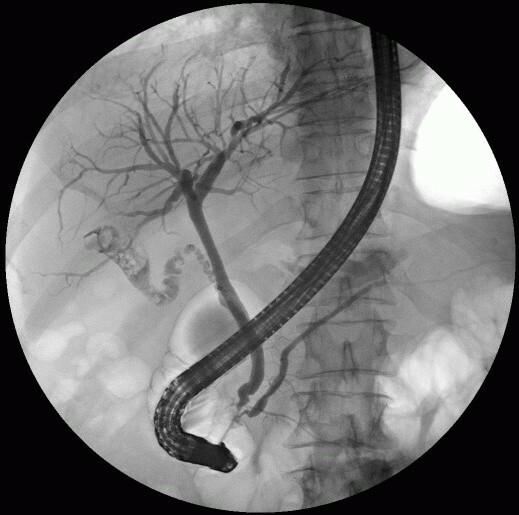 Since the majority of patients with primary sclerosing cholangitis also have inflammatory bowel disease (IBD), the symptoms the bowel disorder may at times mask the bile duct problem. At the outset the symptoms may fluctuate. It may resolve and then recur. Eventually the symptoms become persistent and gradually worsens as the disease progresses. The exact cause of primary sclerosing cholangitis has not been conclusively identified. It is believed to an autoimmune disease. However, there are several genes that have been identified in primary sclerosing cholangitis. This does not mean it is just a genetic disorder. Instead there appears to be a genetic predisposition to develop primary sclerosing cholangitis if associated trigger factors arise. Although inflammatory bowel disease is very common in patients with primary sclerosing cholangitis, the exact link is unclear and both conditions tend to progress independently. The trigger factors that may elicit the development of primary sclerosing cholangitis includes bile duct infections, toxic bile acids and ischemic damage. Ischemia is tissue injury that arises with reduced blood flow to a part of the body. PSC may also be associated with endoscopic procedures where the bile duct is damaged or stents are placed within the duct to keep it open. This triggers the immune system to attack the bile ducts as several different antibodies have been found in the blood of patients with this condition. In PSC, the bile ducts are also prone to cancerous lesions known as a cholangiocarcinoma. The presence of the symptoms , particularly in a patient known to have inflammatory bowel disease, should raise the suspicion of primary sclerosing cholangitis. Various investigations are therefore required to confirm the diagnosis. Tests to assess liver function should also be conducted as the liver may be damaged to some degree by the time the symptoms are prominent. These are the imaging studies that may help confirm a diagnosis of primary sclerosing cholangitis. There are no drugs to treat primary sclerosing cholangitis and reverse the narrowing. Instead medication is used for the symptoms associated with PSC and slowing the progression of the disease. Ultimately only surgical intervention can effectively treat the narrowing and possibly even resolve the condition. Immunosuppressants to reduce immune activity and ultimately decrease bile duct inflammation. Chelating agents to bind to copper and help with its elimination. Bile acids like ursodiol to remove toxic bile acids and minimize further injury to the bile duct. Bile acid sequestrants like cholestyramine to help with bile acid elimination and decrease itching. It may be used in conjunction with antihistamines for pruritus. Antibiotics for bile duct infections. Balloon dilation and stenting to widen the bile duct and keep it opened. Bile duct surgery to remove the obstruction and maintain the continuity of the duct. Liver transplantation to restore liver function and cure primary sclerosing cholangitis.